It seems a bit of a reach to call this a recipe. It's so simple. But sometimes the simple things are the best. My sister Cindy and I used to frequent this sushi place in Savannah. Cindy's favorite roll was a gunken-type sushi filled with some type of crab salad. When I was home during December, she and I went back to that sushi place, and the crab gunken roll was nowhere to be seen. Needless to say, Cindy was heartbroken. I started thinking about the crab salad (and the shrimp salad, which used the same basic ingredients) and figured it couldn't be that hard to make. The biggest stumbling block I faced when I decided to replicate this recipe was access to good quality crab meat. I ended up settling for lump crab meat in a pouch. Is it the same as fresh crab from home? No. Is it better than canned crabmeat? YES! 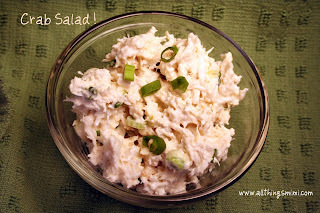 Here is a shot of all the ingredients I used: 1 pouch of crabmeat, some lemongrass paste, Duke's mayonnaise, dijon mustard and chopped scallions. I think Japanese mayo would be a better choice, but I can't find it where I live. Japanese mayo seems to be a bit sweeter. So here's a shot of the ingredients in a bowl. I can't really give you amounts, because it depends on what you decide to put in your salad. It just needs to come together and look like crab salad. I mixed mine with a fork because I wanted to break some of the crabmeat up, but not all of it. Don't over mix this. You want chunks of crabmeat in there. This tastes very similar to what I remember from the sushi place. Cindy will be the final judge, however. You could do this same thing with shrimp or chicken. I'm planning to use my batch a couple of different ways. I have mini croissants to make sandwiches (adding sliced cucumber). I also have spring roll wrappers, so I'll wrap rice noodles, cucumber, avocado, mango and the salad. As an appetizer, I could serve this in little phyllo shells with a sliver of mango on the top. I also think this would be good in a quesadilla with monterrey jack and mango. Sounds like maybe I should make another batch! Nice! I only recently came across your blog, but have enjoyed this post and will be back to read more.